Slowly but surely the Barbet is gaining a foothold in the USA as we welcome 5-puppies born in Indiana on Monday, April 4, brings the total to 70. The Proud parents are Ginkgo de xelaju Amelia (Lia) and Biscay’s Sir Duke (Jacques). 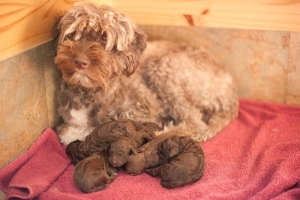 The mother and puppies are doing well. More photos – Lia puppies.